Is Sassafras Tea Safe to Drink? What About the Benefits of Sassafras Tea? There are three species of sassafras trees, two of which are native to Eastern Asia and one to North America. However, fossil records have demonstrated that these trees once grew extensively around North America, Greenland and Europe. All the different parts of the tree are strongly aromatic, and the bark has long been utilized to make various medicines. For example, some people apply sassafras to their skins, while others use sassafras to make tea. However, nowadays, people begin to know the serious concerns regarding the safety of sassafras. So drink sassafras tea with caution. For many years, the oil extracted from the sassafras root and bark has been used to scent soaps and perfumes. Sassafras has also been employed as topical treatment for insect bites and skins. In addition, dried and powdered sassafras leaves and skins have been added to soups as a thickening agent, and dried sassafras root has been steeped to make sassafras tea. However, one chemical that is abundant in sassafras, safrole, is known to be poisonous. 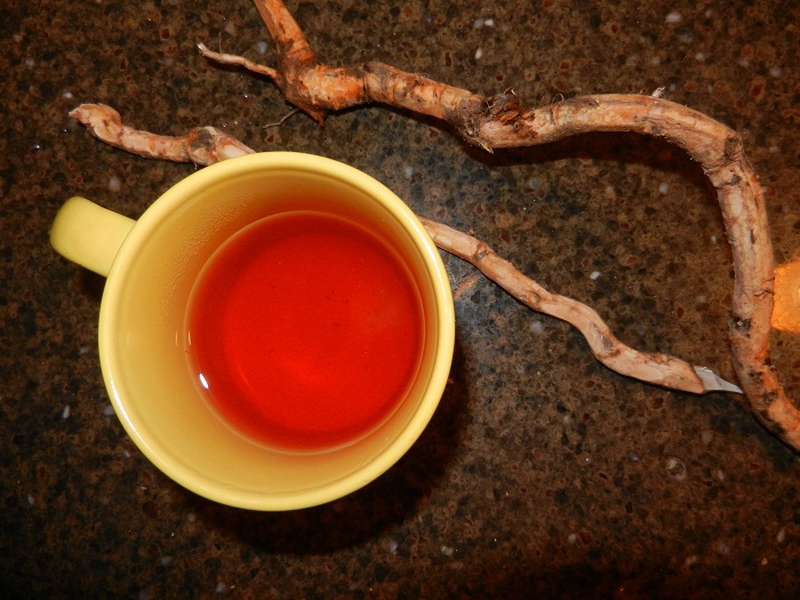 A cup of tea using 2.5 grams sassafras has around 200 mg safrole. This translates to approximately 3 mg safrole per 1 kg body weight – about four and a half times the dose considered to be toxic. Researchers have shown that mice and rats injected with safrole have difficulty walking and regulating their body temperature, and display signs of confusion and nervousness. When rats were exposed to safrole for a long time, there was increased risk of developing liver cancer. For these reasons, the US Food and Drug Administration (FDA) prohibited the use of sassafras in food additives in 1960, and the sale of sassafras tea in 1976. Even knowing the health concern of using sassafras, some people still claim various sassafras tea benefits, and believe the tea can be used to treat the following conditions. Others say sassafras tea benefits in purifying the blood. However, there is not enough evidence for these claims to have been proven. Studies are needed to support all of these claims. Children. Even a drop of sassafras can be fatal. Pregnant and breastfeeding women. There is evidence to suggest that sassafras tea can cause miscarriage. If you have a urinary tract illness. Sassafras may make your condition worse. If you are taking sedative medicine. A sedative drug is any medication that results in drowsiness. Taking sassafras in addition to sedatives may exacerbate the sleepiness. If you are undergoing a surgery. Sassafras can inhibit signals in the central nervous system, causing fatigue. When sassafras is used in addition to anesthesia and other drugs during or following operations, the central nervous system can become severely impeded. Therefore, make sure you do not drink sassafras tea for at two weeks prior to a scheduled operation.